Are you a tour company or accommodation looking to get certified. Join our list of certified properties today. 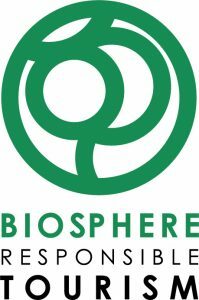 Biosphere responible Tourism is the recognized brand for certifications that meet the system requirements granted by the Responsible Tourism Institute (RTI), an organization born after the World Conference on Sustainable Tourism (1995) sponsored by UNESCO. The main objective of the RTI has always been promoting the principles of the “World Charter For Sustainable Tourism“. RTI is an independent organization and its goal is the implementation of actions and programs for sustainable development in the tourism industry. For this purpose, RTI follows the recommendations of the United Nations Conference for the protection of the environment and development (Rio 1992), and the guidelines of various programs of the World Tourism Organization and UNESCO on sustainable development and protection of cultural and natural heritage. The EU Eco-Management and Audit Scheme (EMAS) is a premium management instrument developed by the European Commission forcompanies and other organisations to evaluate, report, and improve their environmental performance. EMAS is open to every type of organisation eager to improve its environmental performance. It spans all economic and service sectors including tourism and is applicable worldwide. Organisations that register with EMAS must undergo regular third-party audits through a government-approved EMAS environmental verifier. Energy Star ratings are based on energy usage. They are recognized and utilized by the U.S EPA. They have a great globally utilized tool called Portfolio Manager which has helped thousands of buildings get on track with managing their energy output. Since the late 1990’s tens of thousands of buildings and plants have earned EPA’s ENERGY STAR for superior energy performance. On average, ENERGY STAR certified buildings use 35 percent less energy and cause 35 percent fewer greenhouse gas emissions than similar buildings. The EU Ecolabel is a voluntary, third party certified Type I ISO 14024 ecolabel, which was established by the European Commission in1992. Recognised across Europe, the EU Ecolabel helps identify products and servicesthat have a reduced environmental impact throughout its life cycle, from the extraction of raw material through to production, use and disposal. 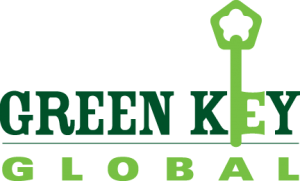 The Green Key Eco-Rating Program and Green Key Meetings Program are graduated rating systems designed to recognize green hotels, motels and resorts that are committed to improving their environmental and fiscal performance. The Green Globe Standard includes 44 core criteria supported by over 380 compliance indicators. The applicable indicators vary by type of certification, geographical area as well as local factors. The entire Green Globe Standard is reviewed and updated twice per calendar year. Green Seal offers certification for the products, services, and companies that meet Green Seal standards. The Green Seal mark represents compliance with a rigorous set of criteria designed to achieve leadership levels in sustainability. Those that have been certified have met the same performance and quality requirements you would expect from the traditional, non-green counterparts due to the performance criteria in each of the Green Seal standards. 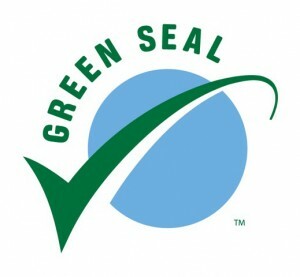 Green Seal certification is not just a “one-time deal”. Companies establish an ongoing commitment to health and the environment through annual compliance monitoring and work towards continuous improvement. Green Tourism is the national sustainable tourism certification scheme for the UK and also operates in Ireland. Businesses opting to join Green Tourism are assessed on-site by a qualified grading advisor against a rigorous set of criteria. This covers a range of areas including energy and water efficiency, waste management, biodiversity, local sourcing, and more. Those businesses that meet the required standard will receive a Bronze, Silver, or Gold award based on their level of achievement. The current network of members is comprised of a wide range of business types, including accommodation providers, visitor attractions, event venues, activity providers and others. Green Tourism BRONZE – BASIC GOOD PRACTICE to reduce the business’s environmental footprint and increase social responsibility. Green Tourism SILVER – GOOD PRACTICE THROUGHOUT to reduce the business’s environmental footprint and increase social responsibility. Green Tourism GOLD – EXCELLENT PRACTICE to reduce the business’s environmental footprint and increase social responsibility. The TripAdvisor GreenLeaders Programme showcases a variety of eco-friendly hotels and B&Bs, from budget to luxury – and they’re all committed to green practices like recycling, local and organic food, and electric car charging stations. All GreenLeader hotels and B&Bs must apply to the TripAdvisor GreenLeaders Programme. If accepted, GreenLeaders achieve one of four statuses: Bronze, Silver, Gold, and Platinum. The higher the status, the greater the impact of a property’s green practices. As the most widely recognized and widely used green building program across the globe, LEED is transforming buildings, homes and communities in all 50 states and more than 150 countries and territories worldwide. LEED guides the design, construction, operations and maintenance of more than 69,000 projects worldwide, comprising 12.4 billion square feet of commercial and institutional construction space, and more than 181,000 additional residential units. The LEED V.4 performance credit system aims to allocate points “based on the potential environmental impacts and human benefits of each credit.” These are weighed using the environmental impact categories of the United States Environmental Protection Agency’s Tools for the Reduction and Assessment of Chemical and Other Environmental Impacts (TRACI). and the environmental-impact weighting scheme developed by the National Institute of Standards and Technology. (NIST). Categories include Sustainable Sites, Energy and Atmosphere, Water resources, Materials & Resource, Innovation in Design and Technology, and Indoor Environmental Quality. Buildings can gain one of 4 ratings: Certified, Silver, Gold or Platinum. For more information on LEED and the USGBC please visit www.usgbc.org. 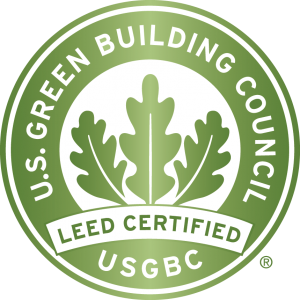 USGBC® and the related logo is a trademark owned by the U.S. Green Building Council ® and is used with permission.